Peter Harrington, the UK’s largest rare book seller has recently published a catalogue featuring 248 fascinating books and manuscripts on Economics, Politics and Philosophy including Mathematics, Logic and Computing. It offers a wide range of items from the seventeenth to the twentieth centuries. Prices range from £200 to £150,000. In the field of economics, there are works from the age of mercantilism by authors such as Josiah Child, William Petty and Andrew Yarranton. Early 18th century texts preceding Adam Smith’s classical text, are represented by such rare works as David Hume‘s Political Discourses, in which can be found the foundation of classical monetary economics, and Jacob Vanderlint‘s Money Answers All Things, the first scientific study of the question of distribution. Daniel Defoe offers advice on how to trade, warning about the dangers of borrowing – he himself had been a bankrupt – and recommending the involvement of a spouse in business. 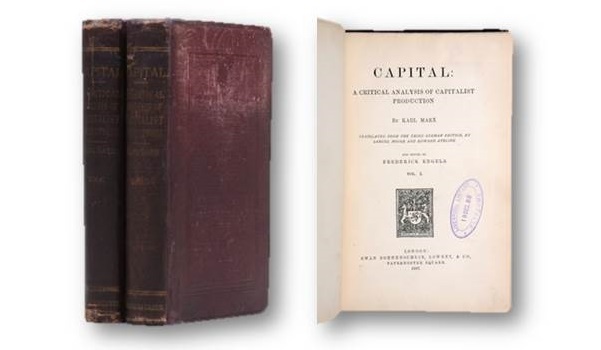 Continental authors include Turgot, Isnard, whose Traite des richesses offers one of the most important contributions in the history of the development of mathematical economics, and Karl Marx. Modern authors include Hayek, Keynes, Henry Hazlitt, and Ludwig von Mises, whose libertarian views have influenced many of today’s leading figures. There are additionally works on finance and speculation, by such noted authors as Charles Mackay, Edwin Lefevre, John Law and R.N. Elliott, the father of the wave principle. In Politics, there are works by early authors such as John of Salisbury, whose Policraticus has been described as “the first medieval treatise on political thought.” Thomas Hobbes‘s Leviathan and James Harrington‘s Oceana examine political theory and the foundations of government. Algernon Sidney and James Burgh consider political freedoms, and in the nineteenth century, there are major American works by John Adams, William Harrison and Abraham Lincoln, all signed or inscribed. Modern politicians and statesmen include Churchill, Gandhi, Martin Luther King, Lloyd George, Enoch Powell and Harry S. Truman. The highlight of the philosophy selection comprises a presentation copy of Ludwig Wittgenstein‘s Tractatus Logicus Philosophicus, inscribed by him to Ludwig Hänsel, one of his closest friends. The catalogue includes works by Montaigne, Hobbes, Bentham, Hume, and several other authors of the Scottish Enlightenment. Rousseau, Condorcet and Voltaire are representative of French Enlightenment authors. Modern philosophers include Austin, Derrida, Jaspers and Bertrand Russell, with works on mathematics and logic by Jevons, Ramsey and Marquand, early pioneers of computing.